While 1Law4All is Trying to Save Our Democracy From Tribalists, They’ve Just Got Around to Inventing a Word For It! Te Karere presenter and Maori language expert Scotty Morrison said he had always received criticism from kaumatua who said “we can’t understand all the new terminology you use on your news programme.” Mr Morrison said the language was evolving and gave the example of hapori to create a new word meaning democracy. So there you have it! 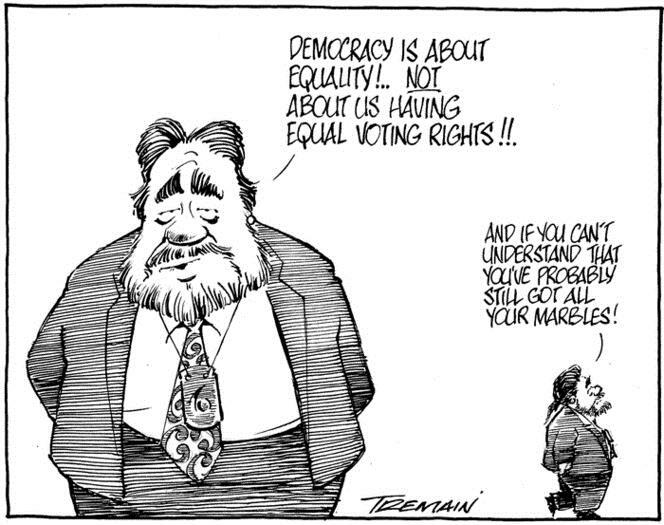 In traditional Maori language, there was no word for democracy. And there was no place for it in a feudal/tribal society, either. Even though they’ve known of the English word for many years, it seems that democracy remains a new language concept in orthodox maoridom. That might explain more than a few things. And here’s another elitist’s view of that odd word.